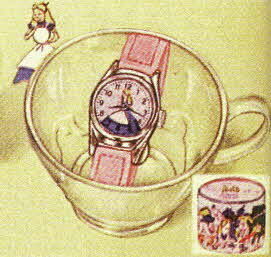 Description It's Alice herself... just as she appears in Walt Disney's latest Technicolor movie... on the dial of an extra small watch! Gleaming, polished case is chrome plated with a stainless metal back. Dainty pink fabric strap contrasts with soft dial colors. Packed in a teacup of translucent plastic. Colorful Walt Disney gift box shows scenes of the March Hare's tea party. Description He swaggers and "gruff-gruffs"... but he wags his plastic tail. Mischievous eyes and felt ears. He has a sturdy 6-inch long body made of wood. Pull cord is included. Description This outfit for aspiring cowgirls comes with eight pieces for an authentic look. Includes vest, hat, holster, and more. 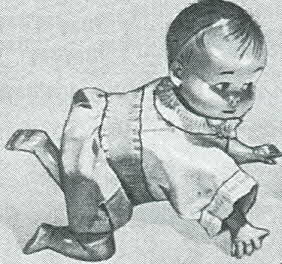 Description This cute little tyke crawls with an extremely realistic lifelike motion that delights youngsters. Has a long-running key-wind motor and a plastic body. 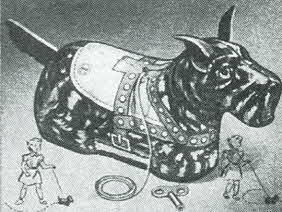 Description Remote control "Scotty" dog. Turns right, left, runs straight or in circles. Remote controlled tension put on leash. He has rubber ears and he makes friends by wagging his rubber tail. 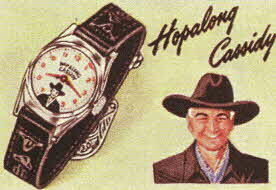 Description Genuine "Hoppy" wrist watch gets youngsters to the Chuck wagon on time! 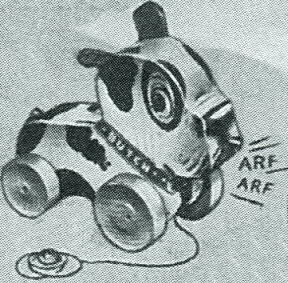 Hoppy's picture is on the smart gray dial. "Good luck from Hoppy" is engraved on the back of an extra small chrome plated case. Description Jeeps gained fame because they were tough, rugged and easy to handle. 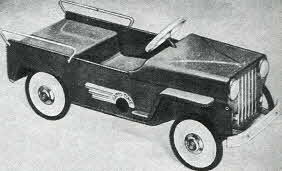 Any youngster can turn, steer and pedal this model. Heavy gauge steel body and undergear. Ball bearing rear axle. Adjustable rubber pedals. Has a bright red baked enamel finish that washes easily, a dummy windshield, headlights and radiator grille are white. 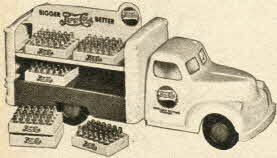 Description Plastic replica of the latest model of Pepsi Cola delivery truck. 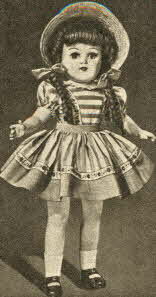 Body has two shelves, holding six miniature dummy plastic cases of Pepsi Cola with molded-in bottles. Pepsi Cola markings on top of truck, also the familiar Pepsi Cola bottle cap at rear and sides. Description Finely detailed, practically unbreakable plastic with jointed arms and legs. Head turns and tilts. Rich mohair pigtail wig frames lifelike plastic head. Has go-to-sleep eyes and lashes. 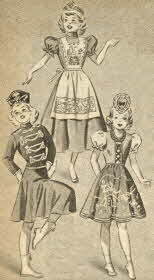 Wears a wide-brimmed straw hat, lace and embroidery trimmed cotton dress, half slip, pants, rayon socks, and imitation leather shoes. 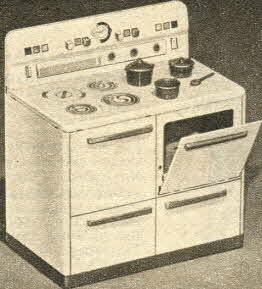 Description Made to look just like a "grown-up" stove! Has a modern design and is made of heavy gauge lithographed and embossed metal in realistic colors. It has a hinged door on the oven, four plastic buttons that actually operate, and comes with durable plastic cooking utensils. Description Action, color, sound. When child pushes, colored rings slide down slanted bars. "Clickety clackety" sound plus rainbow effect. All wood, painted in bright colors. Description Dress like a modern cowboy in the Roy Rogers Western Style Denim. Choose either a jacket or jeans, or get both to complete the look. 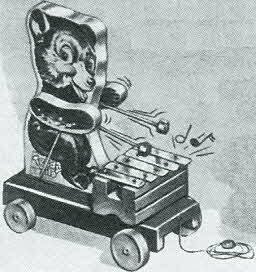 Description The faster he's pulled, the faster he bangs 5 metal keys with 2 wood mallets, playing a lively tune. This sturdy and colorful toy is made of wood. 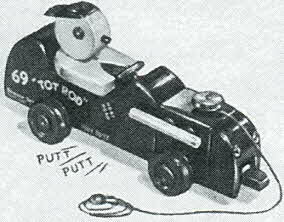 Description Jolly little driver bobs up and down in his seat as toy is pulled; off-center wheels make car jog along. Painted in brilliant colors and is made of durable all-wood construction. 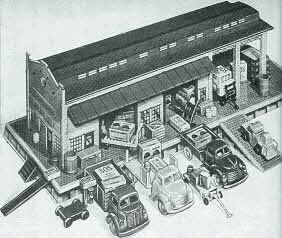 Description Loaded with play value... Toy Town Freight Trucking Terminal is a gift to thrill any youngster. Plenty of make-believe jobs for all the kiddies... truck driver, freight checker, terminal manager, and more. Has 52 pieces including 3 large plastic trucks, 3 plastic baggage wagons, 6 wooden barrels, a dummy scale, and more. 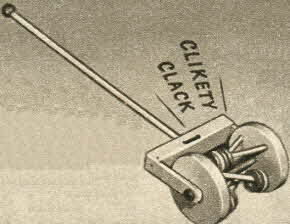 Description Pretty bird trills a merry tune as he swings to and fro on perch. 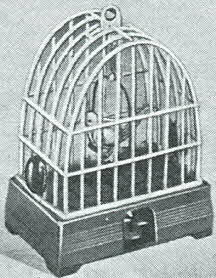 The cage has two feeding cups and a ring at the top for hanging.